NES Teachers Corner – Page 12 – Teach STEM? We can help with that! The deadline for nominations is April 1, 2013. The nomination form should be completed early enough to ensure that the nominated teacher is given enough time to thoroughly prepare an application that reflects exemplary teaching prior to the application deadline. Applications are due by May 1, 2013. Nominate outstanding secondary, grades 7-12 mathematics and science (including computer science) teachers now for the 2013 awards. The Presidential Awards for Excellence in Mathematics and Science Teaching (PAEMST) are the highest honors bestowed by the United States government specifically for K-12 mathematics and science (including computer science) teaching. Established by Congress in 1983, the PAEMST program authorizes the President to bestow up to 108 awards each year. Awards are given to mathematics and science (including computer science) teachers from each of the 50 states and four U.S. jurisdictions. The jurisdictions are Washington, D.C.; Puerto Rico; Department of Defense Education Activity schools; and the U.S. territories as a group (American Samoa, Guam, the Commonwealth of the Northern Mariana Islands, and the U.S. Virgin Islands). The award recognizes those teachers who develop and implement a high-quality instructional program that is informed by content knowledge and enhances student learning. Since the program’s inception, more than 4,200 teachers have been recognized for their contributions in the classroom and to their profession. Awardees serve as models for their colleagues, inspiration to their communities, and leaders in the improvement of mathematics and science (including computer science) education. The National Science Foundation administers PAEMST on behalf of The White House Office of Science and Technology Policy. Visit the Presidential Awards website for additional information, to nominate someone, or to apply. As part of a series of electronic professional development experiences for educators, the NASA Explorer Schools project and the National Science Teachers Association are hosting a 90-minute live professional development Web seminar on Feb. 5, 2013 at 6:30 p.m. EST. Get background information about water recycling on the International Space Station, and then see how to incorporate the information into an exciting hands-on, inquiry-based challenge requiring students to solve a problem. Participants will watch a video showing students engaged in the challenge and discuss possible modifications to the challenge in order to adapt it for different students and classroom situations. This is the final time this Web seminar will be held during this school year. For more information and to register online, visit http://learningcenter.nsta.org/products/symposia_seminars/NES3/webseminar3.aspx. Registration is open for the 20th Annual NASA Great Moonbuggy Race. High school and college students are challenged to design and build a vehicle that addresses a series of engineering problems similar to those faced by the original lunar-roving vehicle team. Each school may enter up to two teams. The race will take place April 25-27, 2013, in Huntsville, Ala., at the U.S. Space & Rocket Center. U.S. teams must register by Feb. 4, 2013. For more information about the competition and to register online, visit http://moonbuggy.msfc.nasa.gov/index.html. Teams with questions should contact Diedra Williams at Diedra.A.Williams@nasa.gov. In this NASA Now program, introduced by Elizabeth Thiel, an NES educator at Komachin MiddleSchool, Shane Brooke, welding engineer at Marshall Space Flight Center, discusses friction stir welding and its use in the engineering of spacecraft. This program is available on the NES Virtual Campus beginning Feb. 6. View a one minute preview of the program, below. NASA’s Mars rover Curiosity has placed its drill onto a series of four locations on a Martian rock and pressed down on it with the rover’s arm, in preparation for using the drill in coming days. The rover carried out this “pre-load” testing on Mars on Jan. 27. The tests enable engineers to check whether the amount of force applied to the hardware matches predictions for what would result from the commanded motions. The next step is an overnight pre-load test, to gain assurance that the large temperature change from day to night at the rover’s location does not add excessive stress on the arm while it is pressing on the drill. At Curiosity’s work site in Gale Crater, air temperatures plunge from about 0 degrees Celsius in the afternoon to -65 degrees Celsius overnight. Over this temperature swing, the rover’s arm, chassis and mobility system grow and shrink by about 2.4 millimeters, a little more than the thickness of a U.S. quarter coin. To read more about the upcoming drilling, visit the Curiosity Mission News. To learn about the engineering and challenges involved in getting Curiosity to Mars, check out four special Mars Month episodes of NASA Now on the NASA Explorer Schools Virtual Campus. As part of a series of electronic professional development experiences for educators, NASA Explorer Schools and the National Science Teachers Association are hosting a 90-minute live professional development Web seminar for educators on Jan. 30, 2013 at 6:30 p.m. EST. In this Web seminar, participants will learn about an engaging algebra activity called “Finding Habitable Planets” that allows students to analyze NASA data with the hopes of discovering planets in habitable zones of solar systems. For more information and to register online, visit http://learningcenter.nsta.org/products/symposia_seminars/NES3/webseminar2.aspx. As part of a continuing series of electronic professional development experiences for educators, the NASA Explorer Schools project and the National Science Teachers Association are hosting a 90-minute Web seminar on Jan. 24, 2013, at 6:30 p.m. EST. Use NASA mission data collected from NASA satellites to see how a planet’s climate is determined. Attend this session and discover how you can incorporate authentic NASA data into your classroom to provide a real-world connection for your students. This seminar will be repeated on May 2, 2013. For more information and to register online, visit http://learningcenter.nsta.org/products/symposia_seminars/NES3/webseminar24.aspx. NASA participated in the inauguration of President Obama on Jan. 21 in Washington, D.C., with two floats and marchers in the inaugural parade. Full-size models of the Curiosity Mars rover and Orion, the multi-purpose capsule that will take our astronauts farther into space than ever, were featured alongside Curiosity team members from NASA’s Jet Propulsion Laboratory as well as current and former astronauts. 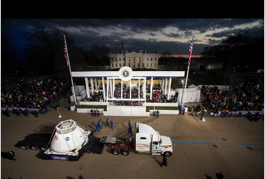 To see the complete slide show of NASA’s involvement in 2013 Inauguration Events, visit: https://www.nasa.gov/news/inauguration.html. This slideshow is a nice extension to NASA Explorer Schools’ Mars Month NASA Now programs. To watch these programs and learn about the amazing engineering feats behind behind the landing of Curiosity on Mars, visit the NES Virtual Campus at http://explorerschools.nasa.gov. Professional Development Web Seminar: Chemical Elements–What are We Made Of? As part of a series of electronic professional development experiences for educators, the NASA Explorer Schools project and the National Science Teachers Association are hosting a 90-minute live professional development Web seminar for educators on Jan. 23, 2013, at 6:30 p.m. EST. Learn how to use the “What Are We Made Of?” hands-on activity to integrate mathematics and physical science in your classroom. Discover how students can use statistical sampling to estimate the chemical composition of the sun by analyzing data in a way similar to the one used by scientists who analyzed solar particles collected by the Genesis spacecraft. For more information and to register online, visit http://learningcenter.nsta.org/products/symposia_seminars/NES3/webseminar23.aspx. Author John EntwistlePosted on January 22, 2013 June 19, 2013 Categories UncategorizedTags Educator Professional Development, NES Lesson-GENESIS:What Are We Made Of? Middle school educators are invited to join NASA for the International Space Station EarthKAM Winter 2013 Mission from Jan. 29 – Feb. 1, 2013. Guide your students in hands-on research as they program cameras aboard the space station to take pictures of specific locations on Earth. If you’re new to EarthKAM or if you registered for a past mission but weren’t sure how to navigate the website and request images, you can sign-up to attend a 30-minute online EarthKAM information session. For more information about EarthKAM and to register for the upcoming mission, visit the EarthKAM home page. If you have questions about the EarthKAM project, email ek-help@earthkam.ucsd.edu.